Dr JBs Red Hummingbird Feeder with Yellow Flowers. BEST Feeder EVER!! 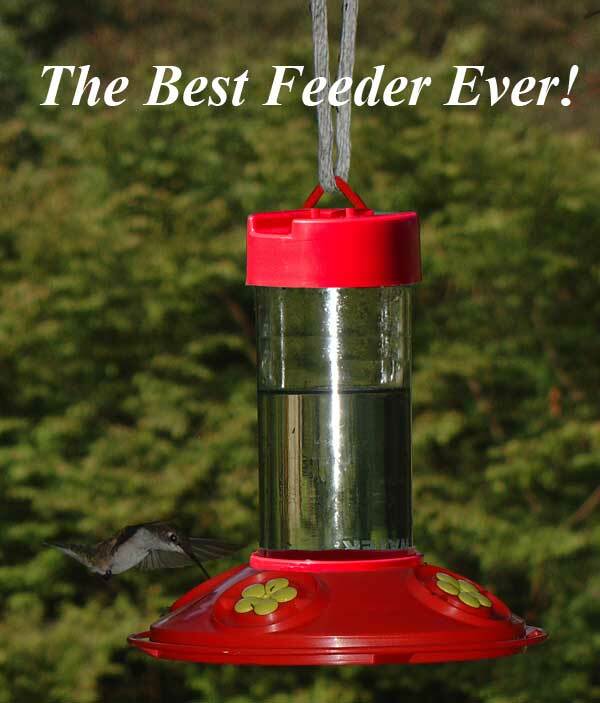 "The Dr JBs red hummingbird feeder is is the best new feeder to hit the market in years! Having been fortunate enough to test the feeder during the design stage, I consider it a huge success! In my opinion, it may just be the last hummingbird feeder that hummer lovers will ever have to purchase. It is worth every penny of the cost. It is a rugged beauty that the hummers love! I have 40 of your feeders hanging in my yard NOW!" - Bob Sargent (President, Hummer/Bird Study Group, Inc., and Master Bander), Trussville, Alabama. Said to be the BEST Hummingbird Feeder EVER!! Introducing the new solution for cleaner feeders. Dishwasher safe (place all parts of the feeder in the top rack of the dishwasher). Wide mouth jar for easy cleaning and no mess when adding sugar and water. No drip design even in high winds! Replacement petals available in purple, teal, yellow and red. See my personal Dr JB's hummingbird feeder review! I ordered my Dr JB's hummingbird feeders on a Sunday and they were immediately shipped out on Monday. Received them quickly and very well packed. I love my new feeders and more importantly, so do my hummers. The only thing about these feeders is you have to make sure that the 2 piece bottom part is firmly snapped together or it will drip. I will definitely order from you again and look forward to my newsletters that I signed up for. The hummers took to it right away, I only have about 4 this year. I don’t know why. I usually have about 10 or so. I received my Dr JB's Clean Feeder late on a Wednesday...'cooked' the nectar recipe, and placed the unit on my deck...walked back into the house, turned around and sure enough hummingbirds at the feeder. I am very happy with the design of the glass bottle (no more funnel!). I love my new feeder and nesting material. We had such an extended cold spring that we didn't see our visitors until 5/15 which is more than a month later than usual. So I put the nesting material out (we've never tried it before) and none of the birds were interested. (Too late) So we are saving it for next year. While the hummingbirds are at our old style wasp waist glass typical feeder. They haven't discovered the new one we call the UFO, yet. So I could say the purchases were a bust.... but I am not unhappy, since they came quickly, arrived intact, and are just as depicted. Good job. Thanks for checking in! I love my new hummingbird feeder! All the wonderful things you advertised about it are true! No dripping and the birds are flocking. It is a wonderful design. So easy to clean, put together, fill. Worth every penny. Thanks for selling such a quality product. And feel free to post this anywhere on your website because I want everyone to know how happy I am with your feeder!! Received my order in great condition. I put out the feeder right away. I don't think I have any visitors yet. I have a hummer in past years but not arriving to later. I look forward to many years of use from the feeder. I love the quality of the feeder I purchased, along with how easy it is to clean. I'm not sure my group of hummers like it. Since I switched out my leaky feeder the hummers don't frequent it like they used to. My mixture is the same (mine was the same as the recipe you sent) so I'm not sure whats up. They may just have to get used to it or maybe they miss the yellow flowers around the feeding openings. But very happy with the product. I really like the hummingbird feeder. It did not take long for the hummingbirds to get used to the new feeder and it seems to keep the bees away, which is the primary reason I purchased it. We had a lot of rain last night and I noticed bees around the feeder this morning. It's possible that the rain increased the level of fluid inside the feeder, allowing the bees access to the syrup, although I really don't know if they were attracted to the water on the outside of the feeder or the syrup inside the feeder. I was also pleasantly surprised wjem I received the feeder within a day or two of my online order, so that was an added bonus. I plan to order another feeder next year. Feeder Arrived. Put up the next day and it took the hummingbirds a day to get used to it. Now they are able to feed without fighting the bees. The cheap, leaky one I got from Lowes looked a lot nicer with flowers painted on the bottle but the birds seem to like this one better. Very nice and well thought out and engineered feeder.